Paste Sessions: Watch The Steel Wheels Channel Doc Watson With Stunning "Spike Driver Blues"
Americana roots rockers The Steel Wheels stopped by the Paste Studio on Wednesday to merge the old with the new, showing off tracks from their latest record, Wild As We Came Here, as well as their take on “Spike Driver Blues” a classic American standard. “Spike Driver Blues” is one of many songs in the folk canon that tells the story of John Henry, the railroad-working steel-driver whose strength and skill was once tested against a steam-powered hammer. John Henry won the contest, only to die from stress and exhaustion with the hammer still in hand. And here’s an exclusive recording of the song by the Jerry Garcia Band in 1987. Made famous with renditions by Mississippi John Hurt, Doc Watson, Jerry Garcia, Taj Mahal, Marianne Faithfull and many others, “Spike Driver Blues” has both a musical and mythological history for contemporary covers to live up to. Steel Wheels frontman Trent Wagler explained the resonance of the song. 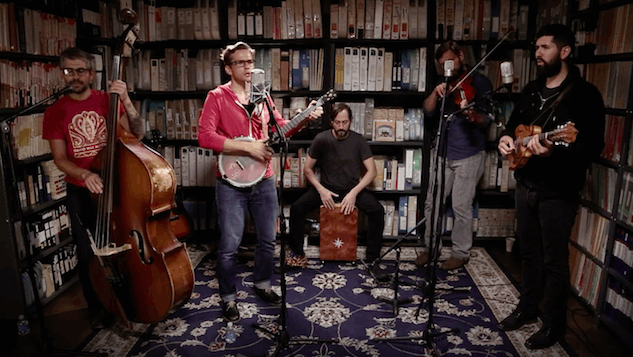 Watch The Steel Wheels revitalizing rendition of “Spike Driver Blues,” as well as their full session with tracks from their new album, Wild As We Came Here.